Zalmoxian Nature Products™ selects the biologically purest ingredients to offer effective holistic products, as Dacia was the country of Bees and Honey, traditional sources of life, strength, fertility and harmony. They come from the Carpathian Mountains, of Transylvania or beautiful spiritual Moldavia. They are Bio-pure and ISO certified. They combined their natural effects perfectly with the Gerovital H3 cure. Referred as the "natural antibiotics", Bee Propolis is the immune system of the beehive. It is also one of the most concentrated sources of bioflavonoids found in nature. They provide a wide variety of important nutritional benefits. Bioflavonoids are strong antioxidants, which protect the body from harmful free radical damage. Many bioflavonoids promote health in ways other than as antioxidants. This 100% pure and natural solution is without alcohol. 20 drops a day recommended. 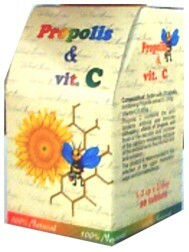 A powerful natural Combination in Capsules: Propolis 0.100gr/Cps & Vitamin C 0.050g/cps. Anti oxydant, Anti Bacterial and Antiviral effects. It boost the immunatry system thanks to the The Vitamin C action. It includes Bioflavone and is 100% pure. It is a proved BRM. (Biological Response Modificator). 100% natural. 3 capsules per day recommended. It contains Apilarnil 0.070g. 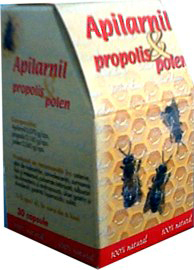 Propolis 0.160g & 0.060g Pollen per capsule. The bee Apilarnil contains natural all the essential amino-acids, Proteins, glucids, mineral salts with oligo elements vitamin B-Caroetn, Riboflavin, Thiamine, Phitomenadone precursor of the sexual hormones. Combined with the pollen and the Propolis it is a Bio-stimulator indicated in asthenia, malnutrition conditions, convalescence, physical and mental over-exertion, late puberty, menopause and andropause (men) disturbances, gastric and duodenal ulcer. 100% natural. One capsule a day recommended.